Flipping through the endless pictures of cathedrals, quaint buildings, and outdoor squares and markets, I stopped her. Jade, what is this photograph? What are those supposed to be? 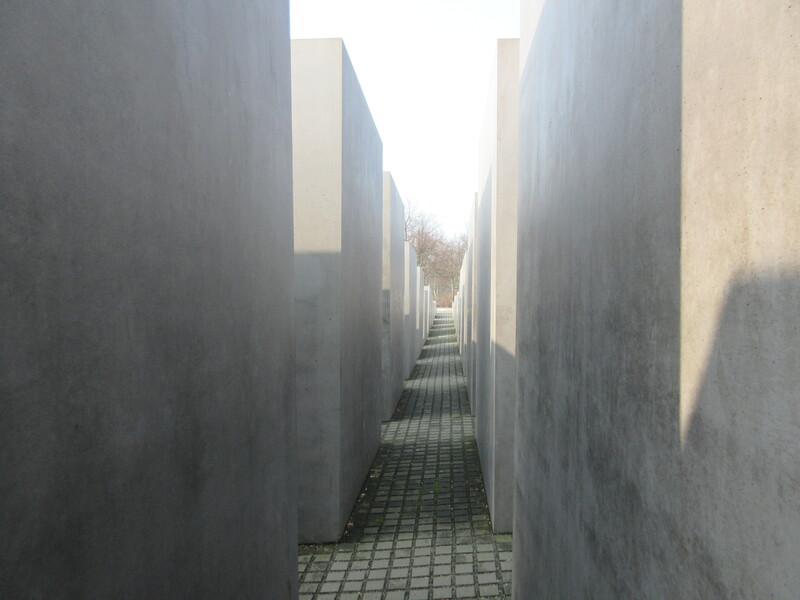 Apparently, I had eyed a photograph of a memorial in Berlin to commemorate Jews killed in Europe. An unusual looking memorial that begs to ask its meaning. Jade explained that the memorial was open to interpretation; something that appealed to the artist in her. There are no names on any of the 2711 gray concrete slabs; no indication of who the victims were or who killed them. No information on why they vary in size. Nothing. Just the sombre feeling, the eerie feeling, the unsettling feeling as you walk the tiny uneven walkways through this maze of concrete slabs; varying in size; appearing randomly done. At some points, Jade felt “trapped” amongst the larger slabs; unable to see around them or to know what was hiding around the corner. Confused and unsettled, she felt “hidden” but “safe”; knowing that for her, there was a way out, eventually. 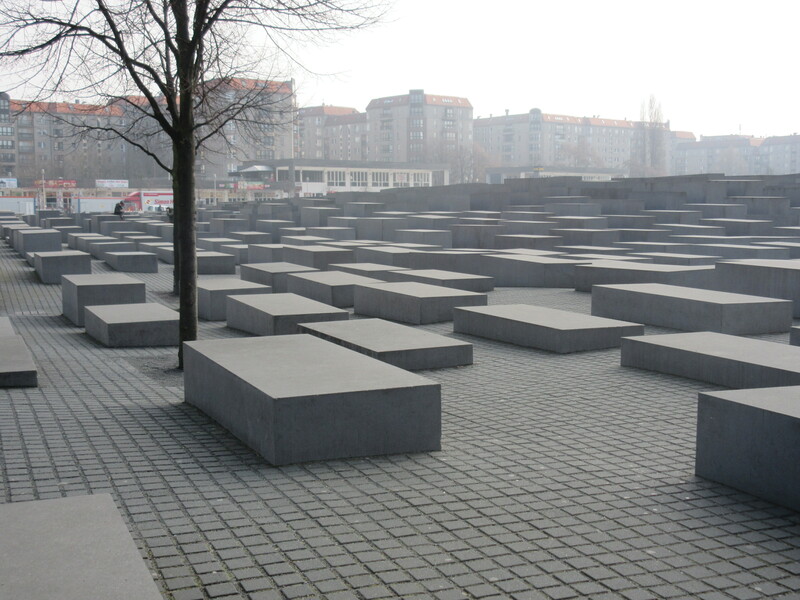 Surrounded in controversy, these concrete slabs are coated with an anti-graffiti substance produced by a company that is also connected to the one, years ago, who was responsible for supplying gas to the gas chambers. Strange as they are, unusual as they are; they still make an impact on the visitor. Maybe not the impact that some would wish, but an impact that one doesn’t forget. Maybe that is the meaning behind them? What Are You Most Worried About When You Travel? Jade was born to backpack. She is a natural at it. I knew this early on when we took a bus from Prince Edward Island to Ontario. She had just finished grade 1 but boy, could she scope out a free seat and get to it before anyone else; even with luggage in tow. Nothing could make me prouder. With these gifts in hand, Jade took to travelling like a mouse to my house. Travelling is Jade’s friend. 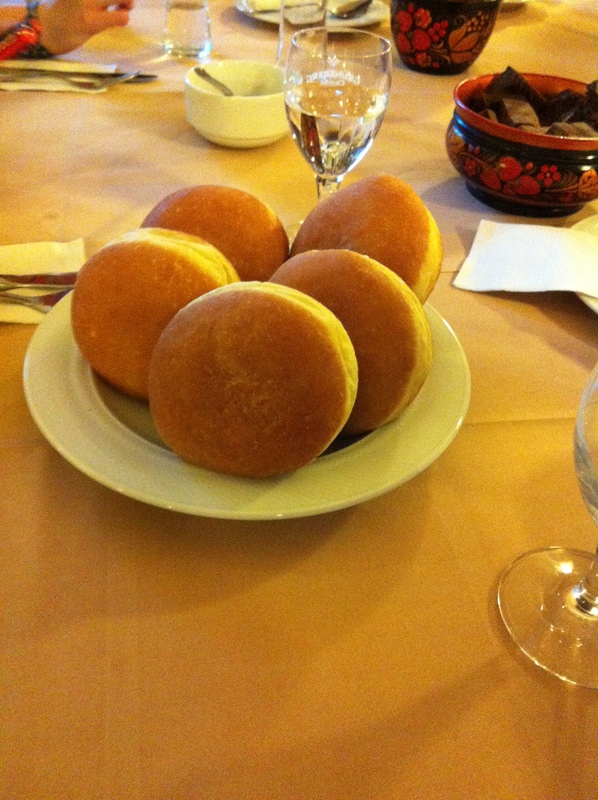 Food is not. She could do without. Apparently not a Jade fav and this appeared twice; which was not so nice. 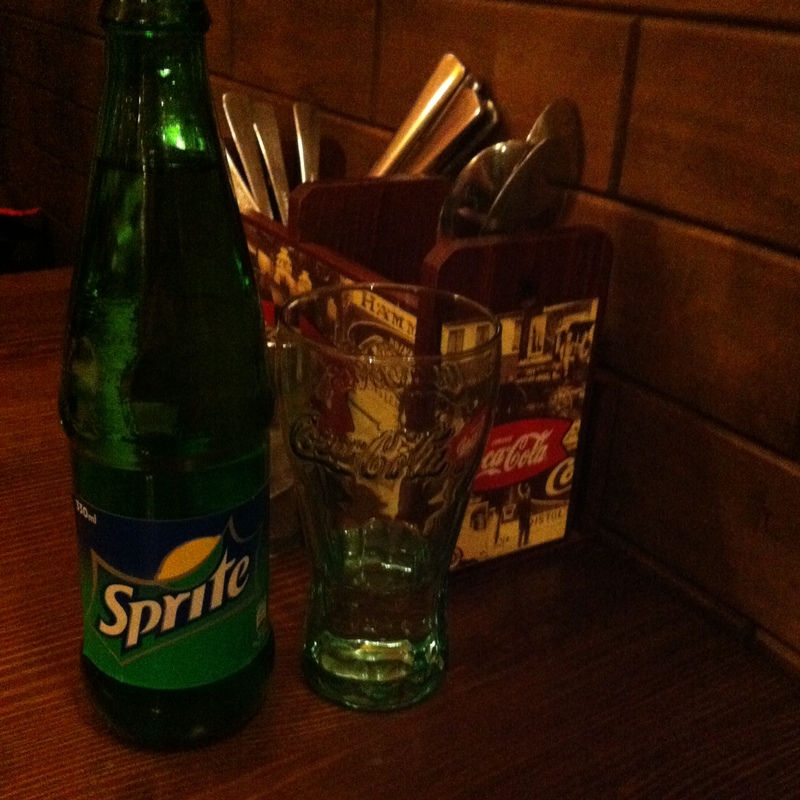 Sprite was a make up for the less than nice dinner that accidentally arrived twice. This company, EF Tours, understands teens well! 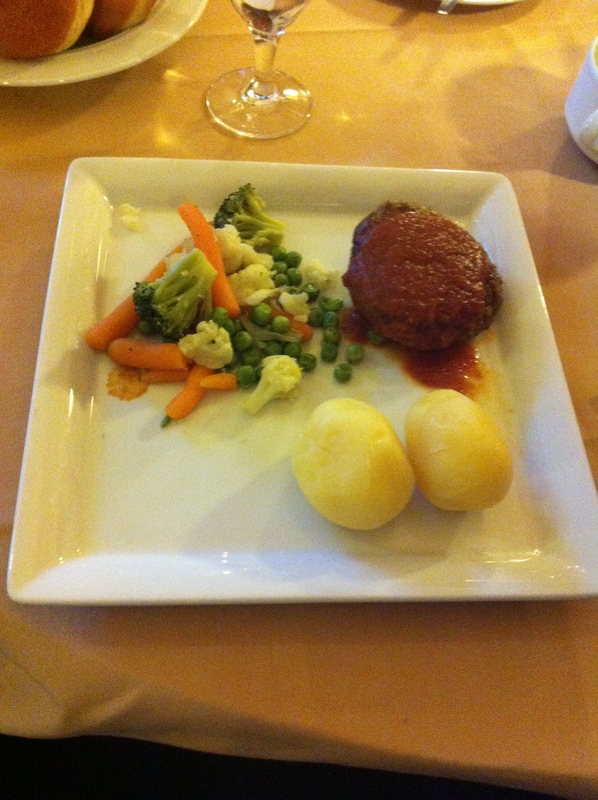 Looks beautiful, tastes well… less than beautiful, according to taste tester Jade. So she looks to a Canadian (?) restaurant for some food aid, but apparently it was false advertising. The so-called Canadian/Ontario restaurant did not win a culinary medal according to taste tester Jade. And then she hit the food jackpot… carbs, hot chocolate and ice cream, of course! Jade will never know how this one tasted, sadly, she confesses.